AccessJ: Japanese Ability to be Linked to Visa Extensions? This article is a bit dated, but I only stumbled across it fairly recently: In May of 2008, the Ministry of Foreign Affairs hinted in a press conference that it would like to start taking Japanese language ability into consideration when issuing visas to or renewing landing permissions for foreign residents. Of course, the Ministry of Foreign Affairs tends to say a lot of things, and some number of its proposals don't actually make it through Japan's legislative bureaucracy and into effect. However, last year you may have noticed on TV or elsewhere news reports of the first 5-year landing permissions being granted to foreign residents in Japan. (Until that time, landing permissions were typically limited to 1- or 3-year durations.) This is all part of a major rollout of immigration policy change decided upon in the 2009 Partial Amendment to the Immigration Control and Refugee Recognition Act. 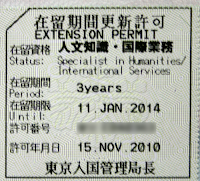 As a recap: The old 1-year and 3-year periods continue to exist, but individuals deemed by the Immigration Bureau to have desirable qualities (such as stable work history or skills in need) may be eligible to receive a 5-year landing permission upon entering the country or to upgrade to a 5-year status on their next extension. 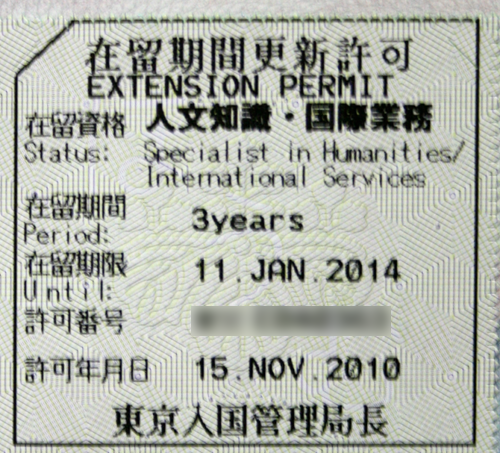 Anyway, NHK gave some coverage of this last year as the first 5-year extensions began to be issued. What I hadn't garnered from the news reports, but which was apparently hinted at in the 2008 press conference above, is that period of stay decisions could also be influenced by Japanese ability of the applicant. In the press conference, the Ministry was careful to point out that any change would be a loosening of restrictions: Individuals who were previously eligible for 3-year stays will not lose their ability to get another 3-year extension because they can't speak any Japanese. However, individuals who were approved for a 1-year landing permission last time might get a boost to 3- or 5-years on extension if they have high-level Japanese skills. At the time of the press conference, it was unclear how the Ministry intended to evaluate individuals' abilities when making their extension decisions. And since the statement 3 years ago, there has hardly been a word on the matter, or at least nothing ready to be found on Google. But, I'm dying to know more about how this went down and whether the Ministry is really still planning to base (or actually making) extension decisions on applicants' Japanese ability. So, is this still simmering away on the Ministry's back burner? Will future applications include some kind of Japanese test or option to submit some kind of certification to be considered along with the application? If you know any more about this, please share in the comments below!